Russian airport operator Basel Aero, which is part of Russian financial conglomerate Basic Elements, is planning additional installations of solar collectors at airports managed by the company in Anapa, Gelendzhik and Krasnodar near the Black Sea, according to a March 2016 press release. The enterprise has devoted special attention to environmental issues: It had already had a solar collector system installed on the roof of the Sochi airport in 2014, before the start of the Olympic Winter Games. The new terminal in Anapa will also be built using energy-saving technologies and eco-friendly materials. 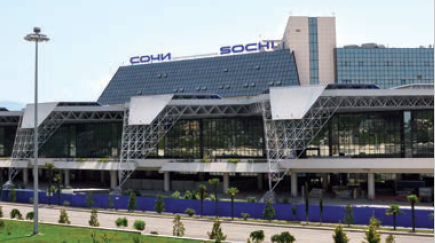 German collector manufacturer Viessmann supplied 132 collectors adding up to 304 m² in total to the Sochi airport in March 2014. During the planning phase, it was estimated that the collector field would cover 85 % of the hot water supply in summer and 25 % in winter. Actual performance data has not been available yet. Leonid Sergeev will personally oversee the implementation of the new solar thermal installations. The CEO of Basel Aero confirmed that the introduction of renewables into the operations of the company’s airports met an acute need to save money because of ever-growing prices for conventional energy resources. Hopes have been pinned on good solar yields because all three airports are in favourable geographic locations in the south of Russia, which benefits from a significant number of sunny days per year. The related tender has not been published so far. Basel Aero was founded in 2007 as a subsidiary of Basic Elements to manage the company’s regional airports. Basel is short for Basic Element. The four airports serve around 5 % of all airline passengers in Russia and deliver about 3.5 % of the nation’s cargo transports, according to the company´s website.